Introducing our new website chatbot. If you’ve been on our website lately, you may have noticed a new character called NEW.B.I.E. NEW.B.I.E is our website chatbot. Why have a website chatbot? We decided to trial NEW.B.I.E (from Newbooks, our booking system) to assist guests with answers to questions. Hopefully, NEW.B.I.E makes our guest website experience easy and convenient. Particularly if you’re trying to find an answer about something outside our office hours. NEW.B.I.E is still in the trial period with Newbooks so any feedback you have would be great. 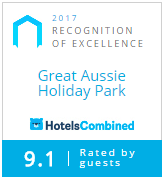 Email us at admin@greataussieholidaypark.com.au. You may also have noticed that we have been introducing technology to make your experience as a guest at Great Aussie Holiday Park quicker and easier. And there’s the added bonus of being greener, by reducing paper use. The above three initiatives will save a huge amount of paper! We are trying to do our bit for the planet and our guests. We hope these changes make your experience at Great Aussie Holiday Park even better.